Ordained through the Academy for Jewish Religion, California (AJR-CA), Becker holds Master degrees in Education, Social Work, and Rabbinic Studies and a doctorate in Education. 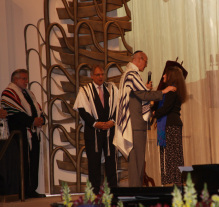 Privately mentored and conferred as cantor, she served as cantor for congregations across Colorado including Temple Emanuel (Pueblo), where she now serves as rabbi. A long-time Jewish educator, she teaches children and adults in religious schools, private tutoring and b’nai mitzvah studies and has been an innovator for community and adult education classes. She is a Storahteller Maven (a knowledgeable person who seeks to educate) and serves as president of the Rocky Mountain Cantors Association. Birdie was honored by Denver B’nai Brith for 12 years of administrative service. In addition to extensive service to the Jewish community, Birdie has a prolific career in the performing arts. As cellist for the violin-cello duo “Apples and Honey”, she performs throughout the Rocky Mountain region. A dance teacher for 18 years, she danced with the Shelhevet Performance Troupe of Cleveland, the Denver Shibolem Israeli Folk Dance Ensemble, and has choreographed and performed for musical theater throughout the Midwest and Rocky Mountain Regions. Composer and performer of folk and liturgical music, she writes short stories and is the author of Conversations at the Well: Where Modern Life and Ancient Stories Meet. As a medical social worker, she is experienced in hospice and psychiatric social work. Becker also served as Ohio State Consultant for Volunteer Services. Certified in Genetics and Infertility, she spent over eleven years in reproductive health, and served as director of an outpatient medical-surgical clinic. Married to Dr. Jeffrey Becker (dermatologist) since 1976, Rabbi Birdie beams most when speaking of their two adult children, Jacob and Rachel.